The Pentagon announced Sunday in a statement it is deploying approximately 3,750 more active duty troops to the southwest border to support the Customs and Border Protection (CBP). The additional troops would raise the number of total active duty troops deployed to the border to 4,350. That is down from a high of 5,900 active duty troops at the border in November. A defense spokesperson said all of the 3,750 additional forces are active duty, in addition to the 2,250 National Guard members at the border as part of the separate Guardian Support mission. Some of the additional units will be deployed for 90 days, the statement said. President Trump initially ordered thousands of U.S. troops to the border in October, ahead of the arrival of at least two migrant caravans heading to the U.S., including one that overran barriers from Guatemala into southern Mexico. The deployment also came just days before the midterm elections, prompting Democrats to claim it was a political stunt. 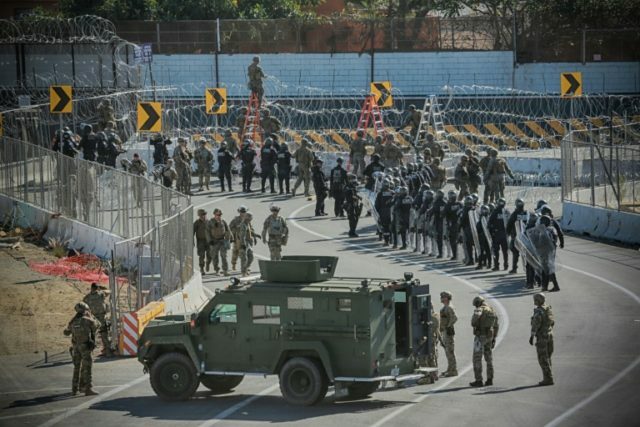 Defense and CBP officials at the time said they were concerned about the violent nature of the caravans, and that the migrants could take buses and arrive at the southern U.S. border within days — a factor that contributed to their decision to deploy active duty forces versus National Guard troops, which would have taken longer to mobilize, and with fewer resources. At the hearing, defense officials defended the troop deployments to the border, arguing that the Pentagon decided to deploy active duty troops versus National Guard forces, not the White House. Then-Defense Secretary Jim Mattis on November 14 said the last four administrations have also ordered active duty and National Guard forces to the border, but Democrats have characterized the deployment of active duty forces to the border as unusual. He said President Bill Clinton ordered National Guard and active duty forces to the border from 1994 to 1995, to assist law enforcement. They manned observation posts, moved cargo and vehicles to support law enforcement, and did cargo and vehicle inspections and aircraft surveillance for narcotics. He said President George W. Bush ordered an operation called Operation Jumpstart from 2006 to 2008, which involved about 6,000 National Guardsmen at the border. And he said President Barack Obama ordered Operation Phalanx from 2010 to 2017, which involved around 1,200 National Guardsmen. “That was the longest period, by the way, of U.S. military support for the border. It was during the previous administration under President Obama,” Mattis said. Trump first ordered the National Guard to begin training at the border in April. The active duty deployment came in November. “This was due to an unprecedented situation with multiple, large-scale caravans en route to the Southwest border. You’ve seen this on the — on the news. One of the caravans overran the border checkpoint between Guatemala and the Mexican border and clashed with Mexican police,” Mattis said.